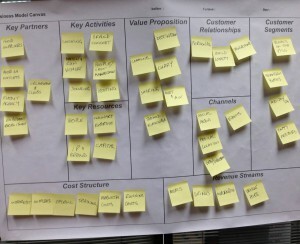 I love the Business Model Canvas*. I know it’s a bit sad but ever since I first saw it in the book “Business Model Generation”, I have been besotted. It just fits the way that I see things, the way that I think about businesses. As a tool, I’ve used it** with businesses of all sizes, with startups, with entrepreneurs at the idea stage – it’s a simple, elegant and yet extremely powerful way of looking at how a business works, or could work. Oh, how I love it – and here’s 10 reasons why. It fits on a single sheet of paper, which means there’s no room for waffle or extraneous detail. You have to stick to key points and that means it’s easy to remember and work with. And it only takes one slide in your pitch deck! The way the canvas is structured brings the internal logic of your business model right to the front. There’s simply nowhere to hide, if there’s a disconnect or logical error then it sticks out like a sore thumb. So many businesses run into trouble because of some basic mistake that would have been easy to fix if it had been recognised early enough. The canvas makes you clear those things up at the beginning. If you put the canvas up on the wall, people naturally gather around and start to talk about it. It’s easy for them to access and understand and they really can’t stop themselves from sharing their opinions and ideas. In fact, most of the value of using the canvas is the discussion it generates. That’s where you find the solid gold nuggets that you can use to refine your model and take it up a few levels. The limited information and the open discussion really forces you to decide what the important elements and relationships are in your business. One of the things that regularly kills businesses and projects are the follies and indulgences of those in charge . Your favourites are put up for scrutiny and if they don’t stand up for business reasons, they go, whatever your sentiment. The outcome is often surprising, what you think is most important rarely is whilst you are ignoring or neglecting what is really critical. It’s a bunch of post-it’s on a piece of paper. I mean, what could be easier to change? In fact, it’s easy to do several canvases around the same business idea, trying out different models and approaches so you can evaluate them and decide which you like best. All it costs you is some sharpies and post-its and a few sheets of paper. Yes, you can spend a long time on your canvas, refining and trying stuff out, but you really can get the basics up in minutes. I went to a talk where Alex Osterwalder got the audience into pairs and gave us three elements of the business model. He then challenged us to do 3 canvases in 3 minutes. Impossible? Over half the audience managed it, and some of the ideas were surprisingly original and robust. You know, no-one really cares about your business or your idea, they’ll have forgotten it almost as soon as you’ve finished. If you want them to remember, you have to tell them a story and make it about the things they’re interested in. You can use the canvas to do this, describing all the elements and relationship in your business in a logical and consistent way, starting from any point. So, if an investor has a particular focus you can start in their area of interest and work from there, gaining their interest right from the start. We all need to review our business on a regular basis but it can be hard to find the time and get the clarity to see what’s going on. Stick the canvas up on the wall and you have a complete picture you can review in minutes, making changes as you go along. Many people I have worked with use it as part of their monthly board review, others have used it to prepare investor presentations, yet others use it on a continual basis to make sure they stay on track. Yes, I know, not only do I love it but I think it’s fun too. How sad. But it is! Most of us have a complete brain fade when faced with the prospect of writing, or even reading, a business plan. 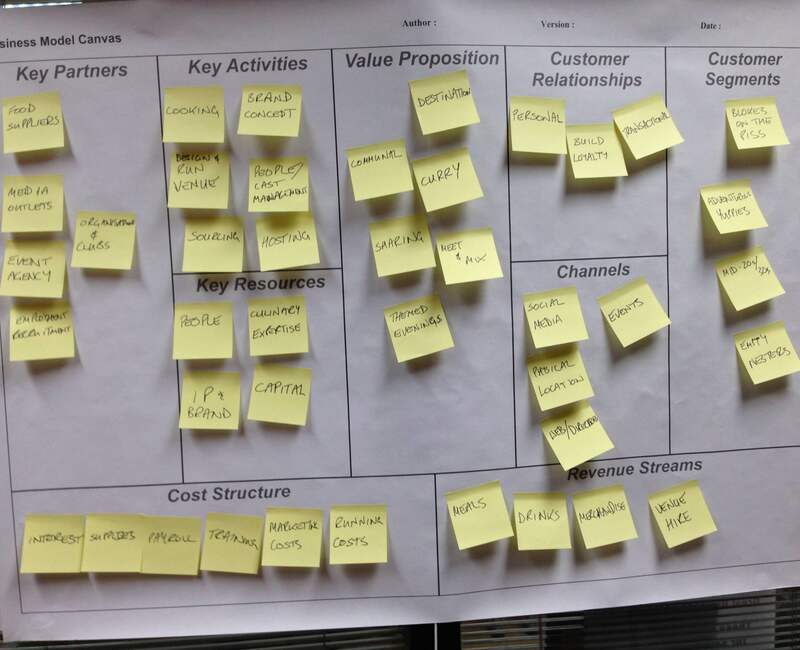 The Business Model Canvas, however, is much more inspiring, engaging and fun to use. It’s made for working on together, collaborating and creating in a lively and joyful way. You can even do it over beers and pizza (other refreshments are available). I’ve run workshops** with all sorts of businesses and entrepreneurs who have created their own canvases and it always provides them with new and valuable insights into their business or their idea. I get a great buzz from helping people see their babies in a new light, helping them to find new ways to look at things and new opportunities to explore. I’m sure it could do the same for your business – just give it a try. *The Business Model Canvas is available for use under a Creative Commons licence. See www.businessmodelgeneration.com for more information.